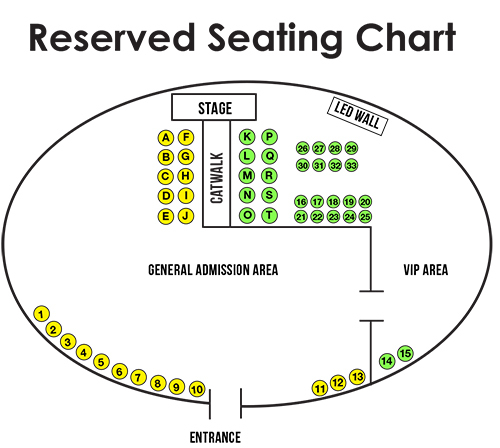 In addition to our standard pricing ($25 for General Admission, $120 for VIP), Chillounge Night now offers four reserved seating options as seen above. All reserved seating options are guaranteed seating and reserved for the entire evening. Reserved seating options only available to purchase till Friday February 19th 6:00pm. If you purchase one of the reserved seating options please go to the RESERVED SEATING table at the entrance for check-in. Thank you. Each General Admission ticket includes admission to the event. Enjoy all the entertainment throughout the evening and access to cash bar and food. Limited sofas, daybed and couches are available first come first serve. You can bring your own lawn chair. Each stunning performance will be captured live and broadcast onto a state of the art LED Wall using HD Video Streaming and making the performance come alive no matter where you are at this spectacular event. Purchase price includes your private Daybed and 2 General admission tickets. Each ticket includes admission to the event, access to cash bar and food. Enjoy the entertainment throughout the evening along the stage / runway. Purchase price includes Private Cabana and 4 General admission tickets. Each ticket includes admission to the event, access to cash bar and food. Includes a 10 x 10 tent with 1 table and 4 chairs. SOLD OUT! Please purchase GA Ticket: Each stunning performance will be captured live and broadcast onto a state of the art LED Wall using HD Video Streaming and making the performance come alive no matter where you are at this spectacular event. It entitles you to complimentary food, desserts, coffee, alcoholic and non-alcoholic beverages throughout the evening in the secured VIP lounge area. Limited sofas, daybed and couches are available first come first serve. Extra chairs will be available however you can bring your own lawn chair. Special Cirque du Chill performances will make the VIP experience a night to remember. VIP restroom trailer available. Purchase price includes your private Daybed and 2 VIP tickets. It entitles you to complimentary food, desserts, coffee, alcoholic and non-alcoholic beverages throughout the evening in the secured VIP lounge area. VIP restroom trailer available. Purchase price includes Private Cabana, 4 VIP admission tickets as well as 1 table and 4 chairs in a 10 x 10 tent. It entitles you to complimentary food, desserts, coffee, alcoholic and non-alcoholic beverages and one bottle of Champagne throughout the evening in the secured VIP lounge area. VIP restroom trailer available. Purchase price includes a Table and 4 chairs, 4 VIP admission tickets. It entitles you to complimentary food, desserts, coffee, alcoholic and non-alcoholic beverages throughout the evening in the secured VIP lounge area. VIP restroom trailer available. Purchase price includes Private Suite, 6 VIP admission tickets with Chillounge Night furniture. It entitles you to complimentary food, desserts, coffee, alcoholic and non-alcoholic beverages and one bottle of Champagne throughout the evening in the secured VIP lounge area. Includes private waiter service throughout the evening. VIP restroom trailer available. CHILLOUNGE LIFESTYLE / COMING SOON! Chillounge Night Products. For more information contact Rainer Scheer directly at 941-448-0995.